The National Museum of Natural History in Sofia (NMNHS) hosts a new contemporary art exhibition in its halls. Titled Ex Wunderkammern, the show is an invitation from international artists Regina José Galindo and Tiziana Pers to start a dialogue about the history of this particular Balkan Museum and the concept of 'Wunderkammer'. Curated by Robert Baramov and Mylène Ferrand. Opening: Monday 13th August 2018, 5 PM. The Wunderkammer, a 'collection-as-expression-of-wonder' (Celeste Olalquiaga), appeared in Europe during the 16th century, and seems to be the precursor of occidental museums. To the encyclopaedic desire at the beginning of Modernity succeeds the cabinet of curiosities in the 17th and 18th centuries which affirm a will to conquest, master and control 'Nature', non-normatives bodies perceived as curious, non-human, 'wild' or sometimes exotic, drawing a line between some humans and the rest of the world. Centred on the question of empathy towards life as an intellectual tool, the two artists engage a deep investigation into the collection, its history and the particular display it proposes. Among the artworks in the exhibition at the NMNHS, Regina José Galindo presents La Oveja Negra. The piece addresses the question of otherness beyond the boundaries of species, using her own body as a canvas to reconstruct the suffering and discrimination not just of the human other, but also of the animal other. Starting from a personal and biographical experience, she created an action based on the concept of the 'Black Sheep', both within a human intra-species system and with a higher viewpoint of an inter-species perspective. The performance was realised while in residency at RAVE, north of Italy, notably directed by Tiziana Pers herself. The two artists not just started friendship but also an entangled collaboration. As a response to La Oveja Negra, Tiziana Pers realised The Age of the flock, a series of paintings depicting animals portraits, represented in their own identity and individuality. In her series Pieces and worlds, Tiziana Pers shows a new body of painted oil on canvas representing animals' gaze (lamb, donkey, horse) as landscapes and other worlds. According to the artist: 'The objectification of the other passes through the gaze. The Museums of Natural History were born so that the body of the other could be observed, studied, seen. They are bodies technically altered and put into cases to be displayed. But they remain lacking a gaze, both in literal sense (they stare at us with glass eyes), as metaphorical (their bodies have been deprived of every ontological subjectivity).' In Tierra, performer Regina José Galindo uses her vulnerable body and stands naked in a verdant field, with an earth-moving machine violently digging the soil around her. If she alludes to murders in Guatemala, she also seems to question the way land was appropriated, such as several bodies, followed by the extermination of people and creatures to whom it is denied the right to live and to not suffer. 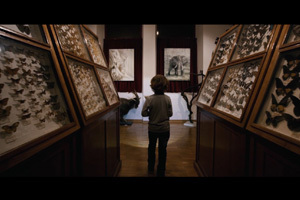 Closely connected with the idea of the wunderkammer Tiziana Pers presents the video and the series of oils on canvas Elephant Song: in the video her son, Ivan, crosses the rooms of the Museum of Natural History of Trieste, creating a path between the destiny of many species (including Homo sapiens sapiens) and the mistakes of the past and the present. At the same time the attempt to connect with the origins, to recover identities, and the investigation on the uprooting and the migrant processes are the core of the performance Raìces (Roots) realised by Regina José Galindo in the Botanical Garden in Palermo. Here trees and plants, mostly transported illegally from all over the world since the end of the 18th century, coexist in the same land. During the 2018 Presidency of the Council of the EU, Bulgaria drew attention to the issues of the Western Balkans. Bulgaria appears as a geopolitical east-west border, a mediation country at the crossing of different cultural zones. In the exhibition Ex Wunderkammern, Regina José Galindo and Tiziana Pers seek connecting also with that context and propose to focus on biocentric ethics. The dynamics of contemporarity transfer the well-established clichés for determining identities and social places, and issue about coexistence is becoming an urgent priority. Spaces of NMNHS are the starting point from which both artists, together with the curatorial team, research the region and look for possibilities to activate new areas for contemporary art /such as the Park Monument on Turna Tepe in Varna/, while in the same context a synchronised parallel public program of discussions and lectures takes place in Varna, on the Black Sea coast — 500 km away from NMNHS. The NMNHS is the oldest museum in Bulgaria and the oldest and richest among the natural history museums on the Balkan Peninsula. It was founded in 1889 by the Royal Prince Ferdinand under the name Royal Prince's Natural History Museum. The museum turned into the main centre of studies on natural sciences in Bulgaria. The monument of Tourna Tepe in Varna has the potential to provide new spaces where culture circles will identify opportunities for art in the near future. It is a practice that the monuments of the totalitarian period are located in strategic places in the urban environment, where citizens can have daily contact with them. Some of the more significant monuments occupy large territories in the places where they are realised. In the volume of the complex on Turna tepe in Varna there are available and constructively solid almost all elements necessary for the development of activities for the citizens — functional architecture — around 6000 sq. m., park space — over 100 decares, arteries for active sport, external and internal scenes, installation of screens and opportunities for any cultural activities almost without limit. The monument itself can be seen as a particularly specific example of brutality in architecture and art, combining the raw artistic aesthetics characteristic of the period of its creation and the unique idea of function in the inner space of a work of exquisite character. About 2000 sq. m. dynamic spaces inside the sculpture and fragments are waiting for the attention of historians and curators for cultural policy planning. Regina José Galindo was born in 1974 in Guatemala City, where she lives and works. Golden Lion for a Promising Young Artist at the Venice Biennale in 2005, her work explores the universal ethical implications of social injustice, discrimination related to race, gender and other abuses involved in the unequal power relations that operate in our current society. She has had solo shows in museum such as Museum voor Moderne Kunst, Arnhem, Netherlands, Modern Art Oxford; Muzeul National de Arta Contemporana, Bucharest; Fundación Joaquim Nabuco, Recife; Museum of Latin American Art, Long Beach, California; Centro Atlántico de Arte Moderno, Las Palmas de Gran Canaria, Spain; PAC Padiglione d'Arte Contemporanea, Milan. She participated in the Documenta 14; 54, 53, 51 and 49th Venice Biennale; XI International Biennial of Cuenca; The Sharjah Biennial; Havana Biennial Cuba; Moscow Biennale Russia; New York. Her work is part of collections such as Centre Pompidou, Guggenheim's Collection, MOMA PS1, Tate Modern. Fondazione Galleria Civica di Trento, MMKA Budapest, Foundation Mallorca, Castello di Rivoli Museo d'Arte Contemporanea, UBS Art Collection, Miami Art Museum, and many others. Tiziana Pers was born in 1976 in Italy. Co-founder and art director of RAVE East Village Artist Residency, she works with various media on the relationship between human and nonhuman animals, and on the connections between different forms of dominion and discrimination. She exhibited and performed in museums and institutions, among the others: Border Crossing c.e. Manifesta12 Palermo; Seoul Biennale of Architecture and Urbanism; aA Project Room Milan; video screening at Musée de la Chasse et de la Nature Paris; PAV Turin; Trieste and Milan Museums of Natural History; Palazzo Pretorio Volterra; Castello di Rivoli Museo d'Arte Contemporanea; Italian Market Hong Kong; One Night Stand Gallery Sofia; Prix-Pictet Palais De Tokyo Paris; Old Police Station London; 53. Venice Biennale c.e. ; Novosibirsk State Art Museum; TriesteContemporanea; N.Est Museo MADRE Naples; DIFC Dubai; Dade Public Library Miami. She held conferences in many Universities and institutions such as: MAXXI Museum Rome, Politecnico Milan, Trieste and Udine University, PAC Padiglione d'Arte Contemporanea Milan, NABA Milan, Dolomiti Contemporanee, École nationale supérieure d'arts de Paris-Cergy.